Comparativism is no longer a purely academic exercise but has increasingly become an urgent necessity for industrial relations and legal practitioners due to the growth of multinational enterprises and the impact of international and regional organizations aspiring to harmonize rules. The growing need for comprehensive, up-to-date and readily available information on labour law and industrial relations in different countries led to the publication of the International Encyclopaedia for Labour Law and Industrial Relations, in which more than 70 international and national monographs have thus far been published. 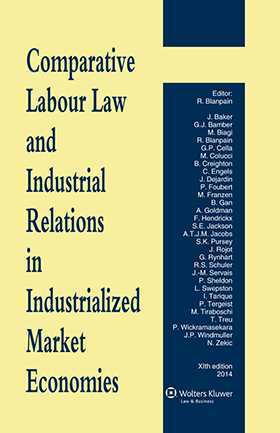 This book, Comparative Labour Law and Industrial Relations in Industrialized Market Economies, goes a step further than the Encyclopaedia in as much as most of the chapters provide comparative and integrated thematic treatment. The aim is to describe the salient characteristics and trends in labour law and industrial relations in the contemporary world. This book is obviously not exhaustive, with respect to the coverage of countries and topics. The authors limit themselves mainly to the industrialized market economies. ;An introduction relating to methodology and documentation, including the use of Internet. The second part concerns international actors, like the International Employer’s Organisations and the International Trade Union Movement, as well as Human Resources Management. The third concerns the sources of regulation, concentrating on International and European Labour Law, as well as on Codes of Conduct for Multinational Enterprises and describes also the rules in case of conflict of laws. The last part deals with international developments and comparative studies in not less than 14 chapters. The XIth edition, will like the previous editions, serve as a textbook and reference work to facilitate the task of teachers and students of comparative labour law and industrial relations. It will also provide labour lawyers with the necessary insights to cope with a world which is increasingly international. Chapter 1 Comparativism in Labour Law and Industrial Relations Roger Blanpain. Chapter 2 Comparative Labour Law: Sources and Documentations Michele Colucci & Nuna Zekic. Chapter 3 National, Regional and International Employers’ Organizations Gary Rynhart & Jean Dejardin. Chapter 4 The International Trade Union Movement John P. Windmuller, Stephen K. Pursey & Jim Baker. Chapter 5 Human Resource Management in Context Randall S. Schuler, Susan E. Jackson & Ibraiz Tarique. Chapter 6 International Labour Law Lee Swepston. Chapter 7 The European Union and Employment Law Roger Blanpain. Chapter 8 Multinational Enterprises and Codes of Conduct: The OECD Guidelines for MNEs in Perspective Peter Tergeist. Chapter 9 Conflicts of Laws in Employment Contracts and Industrial Relations Martin Franzen. INTERNATIONAL DEVELOPMENTS AND COMPARATIVE STUDIES. Chapter 10 Protection of Migrant Workers in the Twenty-First Century: The Role of International Instruments Piyasiri Wickramasekara. Chapter 11 Freedom of Association Breen Creighton. Chapter 12 Subordinate Employees or Self-Employed Workers? Chris Engels. Chapter 13 Working Conditions and Globalization Jean-Michel Servais . Chapter 14 Equality and Prohibition of Discrimination in Employment Petra Foubert. Chapter 15 Employment Privacy Frank Hendrickx. Chapter 16 Labour Law Protections, Training Contracts and the Problem of Youth Unemployment Michele Tiraboschi. Chapter 17 Security of Employment and Employability Jacques Rojot . Chapter 18 National Trade Union Movements Gian Primo Cella & Tiziano Treu. Chapter 19 Forms of Employee Representational Participation Marco Biagi & Michele Tiraboschi. Chapter 20 Transnational Information and Consultation: The Recast European Works Council Directive Chris Engels. Chapter 21 Collective Bargaining: Globalizing Economies and Diverse Outcomes Peter Sheldon, Bernard Gan & Greg J. Bamber. Chapter 22 The Law of Strikes and Lockouts Antoine T.J.M. Jacobs. Chapter 23 Settlement of Disputes over Interests and Rights Alvin Goldman.